Bring alive for your students the history of the early automobile and assembly line with this interactive presentation that meets several Michigan Social Studies Standards. 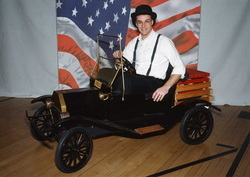 The presenter, Arthur Brood, is an award winning veteran 4th grade teacher who uses a half scale Ford Model T as he role-plays Henry Ford and uses multimedia with interactive activities in an entertaining and educational presentation. He has presented to nearly 3000 students through school assemblies and Interactive TV audiences. He has even been featured on TV 9&10 News in April 2006. "The presentation was outstanding. It was interesting, entertaining, and contained valuable information. Your interaction with the students kept their interest piqued." Booking Arthur is available for a limited number of school visits during the school year. Contact Class Act Productions for more information about hosting a presentation. Scheduling of two schools per day in a geographic area will be given preference. A promotional flyer is available in the link below. Facility Needs: multi-purpose room, multimedia screen, (2) 8 foot long tables, microphone for groups larger than 150 ...I bring the rest! "I learned a lot, you totally acted like Henry Ford." "You are a good actor." "That was an extraordinary presentation! That little mini Model T was the coolest." "I thought it was fun and educational." "This performance / presentation was absolutely phenomenal." "Two thumbs up! That was awesome!"